Place your order before April 30 for delivery before Convention. March 29: The Woodstock of Square Dancing! Folks from many clubs came out for ECR's Woodstock-themed Friday potluck featuring "3 of a Kind" callers Mike Pogue, Regina Schultz, and James Thompson. Lots of tie-dye, lots of food, lots of fun. 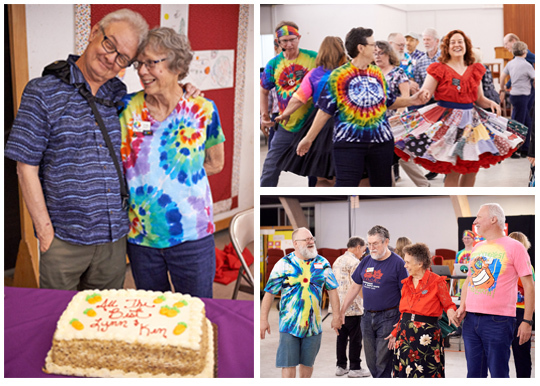 The dance was also a farewell to longtime ECR board co-chair Lynn Ashmall, who has been in charge of the Friday Potluck series, and intrepid photographer Ken Seibert, who will soon be leaving the Bay Area. We'll miss you both! Take Me to the Mardi Gras! Mardi Gras comes back to Palo Alto with a fun-filled appearance by caller Bill Eyler from Palm Springs. Great dancing, lots of costumes and beads aplenty! Guest caller Darren Gallina gets the dancers circling at ECR's February Fun Night. 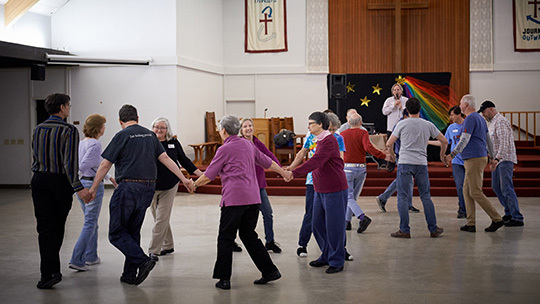 We'll be holding future no-experience-required Fun Nights on the third or fourth Friday of every month (April 26, May 17, June 21) featuring a variety of callers and dance styles to keep things fresh and interesting. For more about Fun Nights, see our Fun Nights page. 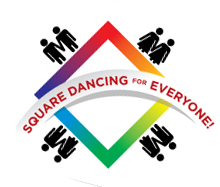 International Association of Gay Square Dance Clubs (IAGSDC), an LGBTQ* Organization. * = Lesbian, Gay, Bisexual, Transgender, Queer, Questioning, and their friends! 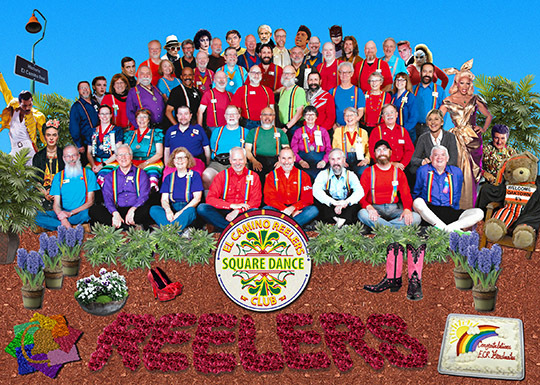 EL CAMINO REELERS is a modern Western Square Dance club, formed by lesbians and gay men in order to meet people, have fun, and learn to square dance. We dance to live callers using the Callerlab Mainstream, Plus, and Advanced programs. LEARN TO SQUARE DANCE! It's a great way to meet active, open-minded, intelligent, and sometimes very silly people. We would be glad to welcome you to our club. Send a note to information@reelers.org and let us know you're interested.